This isn’t a new book, but it’s a great book with a timeless quality that should be read by any entrepeneur, or any business person for that matter — from corporate head honcho to climbing-the-ladder mail-room guy. Yvon Chouinard’s life manifesto reads like an aprés ski cocktail — part autobiography (from steel-bashing piton maker to soul surfer), part business book and part encouraging call-out for corporate responsibility, written with refreshing candour and detail. Part of what makes Patagonia such a respected company in the outdoor realm are Chouinard ideals, and how they are reflected in the workplace. Like here in our neck of the woods with the 20cm. rule, they have flex time if the waves are sweet and the rivers are raging. They have their own on-site daycare so parents can come and hang with their kids during lunch hour. They believe that happy and healthy employees are valuable, productive and committed employees. Thats’ why the cafeteria that serves healthy, organic, mostly vegetarian food and the ability to use company time to participate in Patagonia’s environmental program or start one of their own…as long as their regular job gets done of course. Part memoir, part manifesto — legendary climber, businessman and environmentalist Yvon Chouinard, founder and owner of Patagonia, Inc. describes his life and his start in business as an itinerant climber selling pitons from the back of his car. 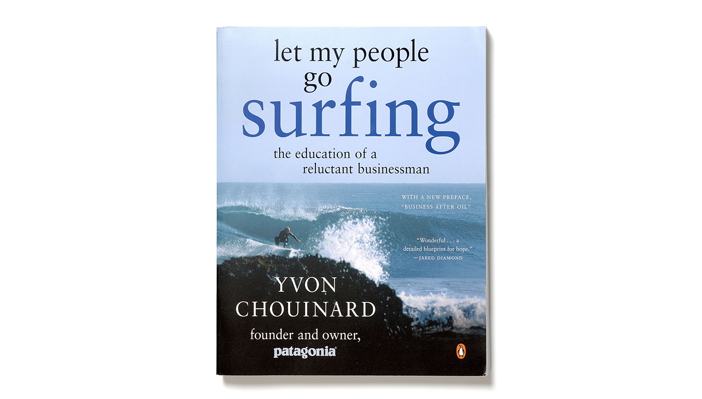 Let My People Go Surfing: The Education of a Reluctant Businessman offers a look at the guiding principles that Chouinard used to build Patagonia into a global business — a business that has an environmental mission and is a fun place to work. Chouinard sums up Patagonia’s philosophy in a few short points, and it’s a solid philosophy that each of us should try and aspire to, if not for the sake of our planet, for the sake of ourselves.